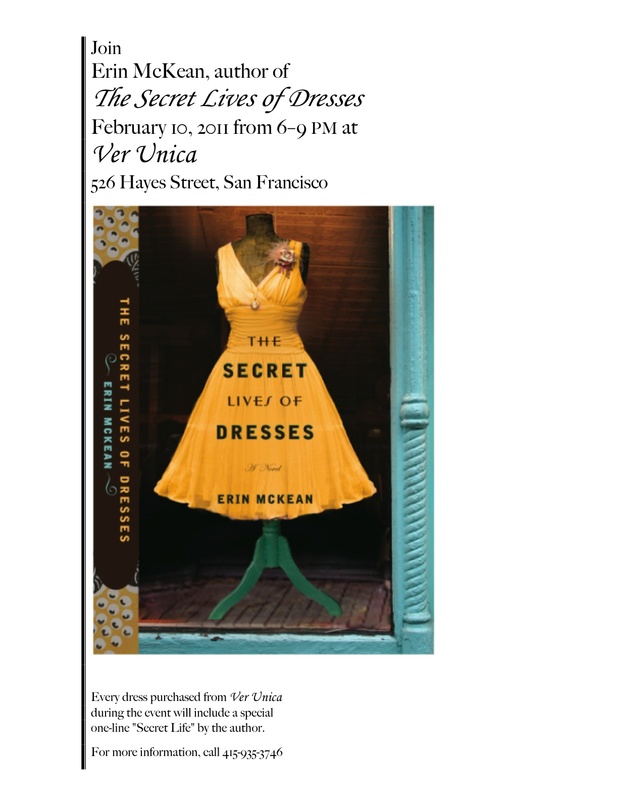 So the first SECRET LIVES OF DRESSES event is scheduled for Thursday, February 10 (the release date), from 6-9 PM at Ver Unica, 526 Hayes St. in San Francisco. In case you can't read the small type, if you buy a dress at the event, I'll write a one-line Secret Life for it (and you)! Needless to say, dressing up in vintage is encouraged. 🙂 Hope to see you there! And don’t forget, as a special treat for book party attendees, all dresses in the shop will be 30% off from 6-9 that night only. Does it get any better? Can’t wait, Erin! I am totally committed to attending the East Bay event. I *might* attend the SF event too, if I can swing the childcare! I sooo wish I could come, but as I live in Sydney Australia, it ain’t going to happen. But my real reason for writing is that I just finished your book this minute, and it’s wonderful. Please can you write a sequel? I want more of Dora and Con! Yippee! I got my book last week, and I’ll rush to finish it before the book party. Congratulations! I would so be there, but I think we won’t be getting into town until the next day, wouldn’t you know it! I will have to keep an eye out for the East Bay event. I’m in London and I got my copy through the post today. Yay! Oh, Erin, I so wish I could go! But Baltimore’s quite a distance from San Fran . . . .
Sending all good wishes your way. Feel free to come to Los Angeles…. 😉 I’m excited to read your book! East Bay Event! can’t come that day/time, but I will be looking forward to the east bay one, do it!!! Read it yesterday. Me likey! Congrats on the book! How about a East coast party? Hi Erin- I just finished your book and I absolutely loved it. I have followed your Secret Lives online, and I think you incorporated them into the perfect storyline. I loved the characters, the respect for age and quality and of course, the ultimate outcome. I wish I was going to be in the Bay Area for your event on Thursday, I would love to meet you. Erin – It was a pleasure to meet you yesterday and the book was great! I think I may have stayed up a bit too late to finish it, but it was worth it. Oh! I wish I had seen this earlier! I totally would have went! I hope it went well! thought I saw on the books inc web site that you would be there the 17th. really wanted to go, but am still recovering from my last weeks trip into the city! I don’t get out much…can’t wait to read the book though! I AM LOOKING FORWARD TO READING YOUR BOOK. I WISH I COULD BE AT THE BOOK SIGNING AND I BELIEVE THIS SPRING SHIRTDRESSES WILL BE APART OF MY SPRING FLING. I just finished this book and I absolutely loved it!!! I couldn’t put it down! WOuld be nice to find out what happens with Dora and Con!! Just finished your book…………….. loved it. Just happened upon it a few days ago. And I am now savoring the website. Wonderful !!!!! I know I’m totally behind on this, but I just had to tell you how thrilled I was to open my latest book club book, and discover that it was *your book*. Best choice we’ve had in ages. I chewed through it in only a couple of days. Then Mum stole it.